I have gone on 3 mission trips in the last 3 years and every time I have had to sign a sheet of paper that lists things I will have to give up. I’m not sure if I’ve been skimming over these rights or what, but one very important line caught my eye this past Fall. It was that time again… To return to India and start our 6 week long beautiful bake sale extravaganza (we really make them look fancy) and to meet bi-weekly to plan and prepare for the almost two week long trip. At this particular meeting we had to fill out an application and the normal “rights” form. I know mostly what to expect on mission trips already and I’m not a princess in the since that I have to have certain comforts from America. But, I never noticed that on this piece of paper that says “I give up my rights” It listed “for my mission to be successful”. As humans we like to compare things. “My first baby was sweet and hardly cried. This one… Ugh! This one screams like nobody’s business.” “When I worked for the other company they bought us lunch every Friday. This company is cheap!” Etc… Well, on my first trip to India we spoke at 3-4 churches, orphanages, schools & sewing centers almost daily. We didn’t fly within the country. We were surrounded mostly by people who knew Christ already or who were learning. We were very safe and we were in familiar territory for our team leaders. We had a larger team and bigger suitcases! But, this time was different. I GIVE UP MY RIGHTS TO BE SUCCESSFUL!?? How can this be? It has to be successful! We’re taking donations from people!! Let the slight panic begin. Not really panic but definitely confusion. Ok… A little panic and confusion. As I muddled through that line over the next few weeks and then remembered it everyday while I was in India I have to say by my old standards this trip was not successful. I got terribly sick and was unable to help the day of our second medical clinic. We traveled inside the country way more than we did in the past. It was exhausting. We didn’t feel like we did much. We didn’t get to verbally tell people about Jesus at the three medical clinics we did for safety reasons. All we had was a carry on and backpack! The old Rachel (that would be the very opinionated me) would not have called this trip successful by any means! It was tough! It was exhausting! I ate very little other than rice for most of the trip. I even lost my prescription sunglasses and neck pillow on flight 2 of 8! I Had to keep saying “it’s part of the sacrifice”… “It’s all part of the sacrifice”!! He is so good! Everyday he showed me how this trip truly was successful. In my complaining (mostly internal), he gently reminded me that we handed out medication to more than 1200 people 3/4 of whom had never heard the name of Jesus! He used me to bandage the wounds on two little boys (I’m a mom, I’m a pro!). We played with children and taught them a few English words. We hugged. We played cricket. We took pictures. We made them laugh. We brought joy, pain relief, dewormer, vitamins, and antacid to all ages… We showed them who Christ is. We opened the door for more ministry in parts of the country where white people had never been and where Jesus Christ had never been preached. We survived the attacks of satan! 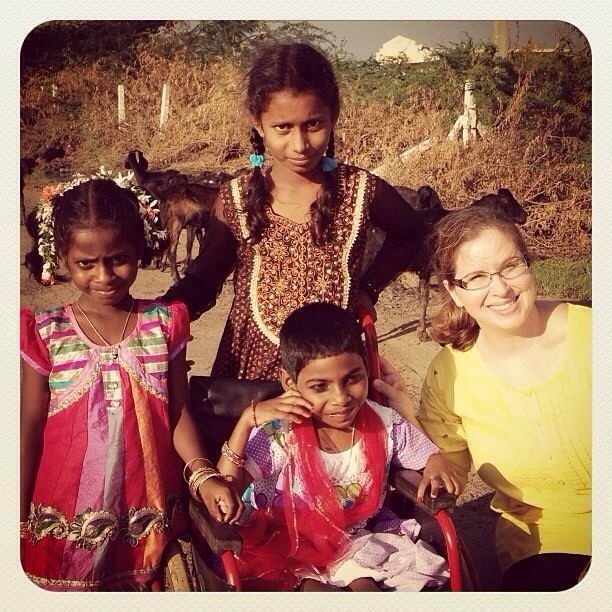 We carried out the great commission and I fell deeper in love with the people of India. How could I possibly call this trip unsuccessful? I am now completely convinced that there is no mission that ends up unsuccessful by God’s standards. None at all. By our standards… Sure. But, by God’s hand it is either the people who will be shown Christ, or you who will be taught a great lesson, or both. Today I encourage you to look beyond your circumstances and see with your spiritual eyes what God’s great and awesome plan is. Find the lesson that you need to learn and remember that actions speak louder than words.